Dr. Whipple left her home in the Boston area to attend the University of Pennsylvania School of Veterinary Medicine. She joined a multi-doctor practice on the Main Line after graduation. In 1987 she established the Berwyn Veterinary Center in Berwyn Pa. She became certified in veterinary acupuncture in 1998 and has been following her interest in alternative medicine since then. When she is not at work she is feeding her passion for opera and tending her herb garden. Kim was born and raised in Ardmore, Pennsylvania. After graduating from Lower Merion High School, she earned her degree in Veterinary Technology from Harcum College. She joined the staff at Berwyn Veterinary Center in 1994. She is the head technician and the doctor's main assistant in surgery. Outside of work, Kim enjoys running, competing in triathlons, spending time with her dogs, cats, and chickens! 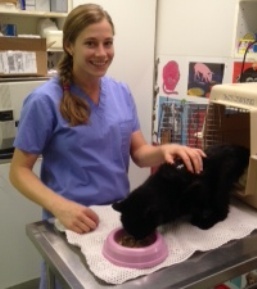 Emma has worked at Berwyn Veterinary Center for 8 years. She is currently the Therapy Laser Technician and Office Manager. She thoroughly enjoys laser therapy and seeing the difference it makes in arthritic patients. In her spare time she enjoys gardening and taking care of her cats and ducks! Heather graduated from the vet tech program at Harcum College in 2016 when she decided she wanted a career change. She joined us shortly after. She shares her home with her cat, Angus, and her two rabbits, Clover and Oliver. Heather loves to spend her free time doing just about anything outside - hiking, biking, kayaking, gardening and camping! Omi is a beautiful cat who came to us as a very sick kitten. He enjoyed it here so much he never left!